It is no wonder that my #66 Love Bus mates think what I’m knitting is a scarf! It’s all curled up on itself; the Stockinette St sides just can’t help themselves. In fact it is the Right Front of my Twist cardi that I ripped out last week now re-knit. Its going really fast – even though I had hoped to finish the WHOLE SWEATER by now, it is still going well. Fate always seems to intervene in my personal wardrobe, stalling, mauling and giving me random reality checks. It’s really OK, though. This little piece went on the road this weekend, out to the Western suburbs for a workshop. The very accomplished ladies from the Fox River Valley Knitting Guild invited me to present a morning of tips and tricks to their group. We had an outstanding time learning all about basic body measurements and fit, taking turns measuring a partner and finding out what our own bottom line was. I’ve found that many of us don’t come from a sewing background and garment construction, even after knitting multiple sweaters, can be a mystery. Or in my case, even with a sewing background, I didn’t learn how to really understand what a pattern was doing because I didn’t take the time early on in the process to investigate how that particular pattern was actually going to measure up to my real world figure. The peculiar thing about knitting is there is rarely a Dressing Room where you can go try it on before you start! 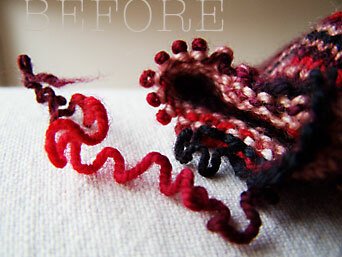 It is a leap of faith on our part when we cast on those first stitches and let ‘er rip! And sometimes, because we didn’t think it through, we have to let ‘er rip in another more Tragic Way later. The piece you see above replaces the first Front piece I did because of some heinous cabling mistakes I made early on. 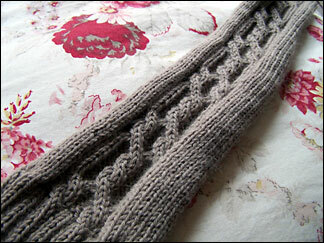 So, I took the opportunity to tweak it some more – I wanted longer ribbing, and now I got my wish. Almost a Squee Moment replacing the earlier weeping. Almost. before I watched the Oscars! The ONLY thing good about this excruciatingly LONG & Boring (yes, redundant to Even Mention It) Show was that my absolutely Favorite Director of All Time FINALLY was given his due!